The Line Up is announced AND Tickets Go On Sale on Sunday 18th Dec at 7:00pm. 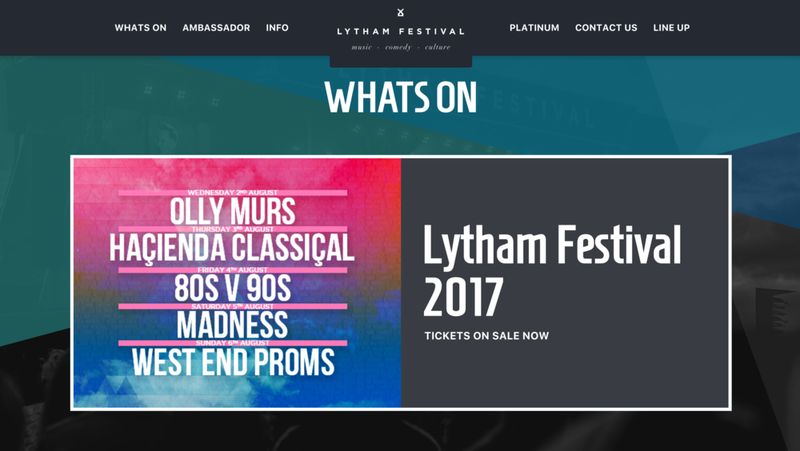 There will be a few ways in which you can bag yourself that all important Lytham Festival 2017 Ticket. This will be the quickest (and cheapest!) way to bag yourself a ticket for the Festival. To ensure you are registered for tickets, please head over to www.lythamfestival.com/account/ to update your unique password, or alternatively if you have never been to the Festival before, you can create an account here too. You’ll be able to change your password to something memorable once Set Up or Registered. Once registered you will be able to purchase tickets and keep up to date with the latest shows and offers. This means you can book online via the website quickly and easily, add upgrades in the future and personalise your journey with Lytham Festival too. Customers who book via the website will be charged £1.00 per ticket booked (£5 for The Marquee). There will be a charge for having tickets delivered by secure delivery of £5.95 per order. For 2017 we will be offering customers the option to have an E-TICKET for immediate delivery to your inbox. The E-TICKET option is Free of Charge and is the very best way to secure your ticket. If you’d prefer to speak to someone over the phone you can give us a call on 0844 815 4874. For phone bookings a £3.50 per ticket booking fee is payable. This covers the cost of the call centre staff who take the bookings. If you do not want to pay this fee we advise you to Book Online. In addition if you want your tickets posted there is a £5.95 per transaction fee to cover the cost of delivery. You can opt to have your tickets sent as E-TICKETS by email, for this there is no charge. You can head to Lowther Pavilion and Book your Tickets in person at their Box Office. For more information on their opening times and location head HERE. Lowther Pavilion Booking Fees will apply.